The organisers of FinanceCamp have announced that the event, which expertly matches hundreds of growing and innovative businesses with active investors and lenders, will in 2018 form part of the Great Exhibition of the North’s ‘Inspired by’ programme. FinanceCamp focuses on growing the regional economy by bringing businesses with bright ideas together with the finance they need to grow. The annual event is an active example of how innovative enterprise from across the North East is disrupting industry; chiming with The Great Exhibition’s aim to showcase and celebrate the world-class innovation coming out of the North of England. Estelle Blanks, Executive Director at the Innovation SuperNetwork who organise FianceCamp, said: “Innovation is in the DNA of the North East business community. Ideas coming out of this region have been changing the way we live for hundreds of years and FinanceCamp is the ideal opportunity for growing businesses who have an innovative product or service to source the funding they need to make that big idea a truly life-changing one! 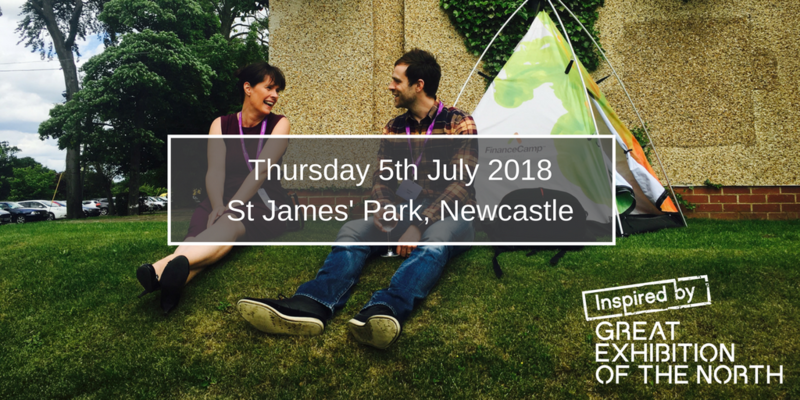 FinanceCamp takes place on Thursday 05 July 2018 at St James’ Park, Newcastle. More than just an event, FinanceCamp is a programme of investor readiness opportunities for businesses ensuring they maximise their chances of securing the funds they need. With access to experts in a range of professional fields businesses are given the advice they need to strengthen their business proposition, consider different finance options and understand investor needs to perfect their business pitch. For more information and to apply, visit www.FinanceCamp.co.uk. The Great Exhibition of the North is a free and family friendly, 80-day celebration of the great Art & Culture, Design and Innovation coming out of the North of England. The Inspired by programme seeks to celebrate the breadth of experiences and events across the whole of the North of England taking place 22 June – 09 September 2018. Visit www.getnorth2018.com for more information. FinanceCamp is part of the wider Innovation SuperNetwork programme, delivered with over 50 partner organisations to support innovation in the North East. Innovation SuperNetwork is supported by the North East LEP, Innovate UK, Northumbrian Water, Reece Innovation, Engie and the North East BIC, with part-funding from the European Regional Development Fund.